Apparently there’s this thing called National De-Lurking Week. And apparently it is now, January 8-12. It’s a week when readers of blogs are invited to come out of hiding, and make themselves known to the other members of that blog’s community. So I invite you, dear readers, to introduce yourself with a comment. Whether you’re a new commenter or a regular, say hello and let us all know you’re out there! Where do you currently live, and what is your favorite thing about it? Cool! I didn’t know about this NDLW. I’m not technically a lurker since I’ve only had you on my RSS feed for a week or so via 20SB but…I live in Boston, and my favorite thing is probably being able to go to Fenway to cheer on the World Champion Boston Red Sox!Thanks for the heads-up on NDLW; I will spread the word! Like the fabulous girl at “Le Petit Chic”, I too live in Northern Virginia. I love it because I can easily feed my political addiction here. On the other hand, I hate it because the real estate is so dang expensive!And let me tell you – the fact that Les Mills group exercise classes have not yet made their way to L.A. is a SHAME. When I lived out there I found ONE Gold’s Gym in Pasadena that offered a few classes, but it was so out of the way I never went. I live in Valley Village, CA in a townhouse you will be at Saturday night. heheThe thing I like about it the most is that it’s big enough to have people over and be social. And it’s in a good location next to lots of freeways to people can get here fairly easy. I’ve been reading for a long time now, it’s one of my everyday reads! I’m living in Northern Virginia, it’s OK here, but not somewhere I would want to make our lives, we are actually planning a move back to PA in about a year!! But as for VA, I like being in the nations capital, it’s full of culture and things to do. But I can really do without the traffic and crazy drivers on the beltway! Hey! It’s Emily. I’m living in Portland, which I love because it has the best of California (tons of socially-conscious hippies & vegan places to eat) and New York (awesome public transit and cool things to do). I live in NYC, well, until Saturday when I’m moving back to SoCal.My favorite thing about NYC is the restaurants, and my favorite thing about Cali is the weather and the laid back pace. I live in downtown Seattle. I love it because I can walk everywhere and the bus drivers are friendly and there are cafes everywhere! Hi lady!I blog anonymously, so I try to keep any search terms away from my name.However, my clue is that I live in the city of the 2010 Olympics.I adore it because it is multi-cultural and so beautiful in the summer time! I like this idea! I currently live in Seattle and love the bread here! it’s excellent, the breadmakers have a true reverence for the art. Sigh. I’m CURRENTLY in London, and I love that the transport is so easy to use. 😀Happy delurking day! Yay for de-lurking!I live in West Virginia and I like it because there’s NO traffic on my way to work. Unless you get behind a trash truck. Well this is news to me! Could it be because I’ve always got my nose in hiking books/maps or glued to the monitor searching itineraries? 😉I’ve got my digs in Italy and I like it mainly for the FOOD! Oh yeah, hiking too!! I live in a house in Burbank. My favorite thing about our house is our nice big backyard. The thing I like best about our location is living so close to the Chandler Bike/Walk Path. We LOVE riding our bikes on it. 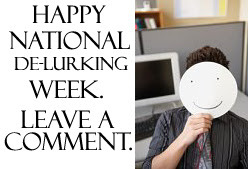 🙂 Happy De-Lurking week! Hey there missy! I live in Baltimore and my favorite thing about it would be the short drive to my favorite city- 3 hours to NYC! since you delurked on mine i’ll delurk on yours 🙂 I live in washington, dc and i have no favorite thing about this city 😦 i want to move back to boston/nyc. hah! hi, uhhh … i live in … um, the pacific ocean … and, uh, i like it because … um, it’s spacious. I live in good ol’ Kentucky. I love it because it’s so green. Another nice little thing about Kentucky…we will fall out of a barn trying to wave at a passing car. Gotta love good southern people. I live in a crappy little place in LA and the best thing? Mexican food.Heyyo! Well hello! I live in The Hunter Valley-about 2 hrs from Syndey. Apart from being in a major wine making region (yay)we have pretty awesome weather (can’t believe i just wrote awesome..! )Nice to meet you! Well, if I go with where I live <>now<>, it would be in Los Angeles with you, wifey. But if I cheated and went with where I grew up, it would be Lodi, CA (which I love because of the semblence of a winter during the “winter months”, as well as the 34 operating wineries in the area which are fun to go wine tasting at). I love Los Angeles because it’s a huge city with <>so<> many places to explore. Happy de-lurking week!! I live in Columbus, Ohio, which honestly does NOT have as many cows as outsiders think we do. Seriously, we’re a real city. Um anyway, my favorite thing about living here is that it’s a small city, so there is a lot to do within walking distance or a short drive from our apartment. And there are TONS of festivals in the summer and fall…tomatoes, pumpkin, German, Italian festivals…you name it, we (might) have it! I live in Portland, OR. I like that it is a small big city. My in laws are here, which is really great, they are wonderful. I do hate the clouds and rain at this time of year. I live in the west end of Glasgow, which is kinda cool, the area I live in is almost a separate village in itself; loadsa cool shops, bars, and the botanic gardens to sunbathe in on the (rare) occasion the sun comes out. I’m in the fabulous city of Chicago. I love it because there is ALWAYS something to do, no matter what you are up for! Wow! Look how many lurkers you have!I live in Clearwater, Kansas, and the best part about my home is that I can ride for hours and hours on decently paved roads (well, the first couple miles are dirt) that are practically empty of motorists right out of my driveway! Also, I have never been hit by a car in Kansas (not so in California)!And Miss Scarlett, I teach cycling classes for a program called Group Ride, which is run by Body Training Systems. They used to be affiliated with Les Mills, and so you might have more luck finding Group Ride or some other BTS class in LA. i’m a little late but happy belated national delurking week anyway! 🙂i’m currently living it up in columbus, ohio (yes one of those midwestern people). i love it. this is kind of a nerdy reason to love it but it is the easiest city to navigate, for real. the infrastructure is great. we have a main highway that runs north and south thru the middle of the city. one that runs east and west. and one that runs in a circle. i’ve never gotten lost. I’m not technically a lurker, and delurking week is actually overrrr, but HELLO! Thanks for checking out my blog and adding me on 20sb.I’m currently in Phoenix, AZ and my favorite thing about it is being able to go outside in shorts and a t-shirt in January. I’m told I’ll get over it after a few years, but right now, I am loooving it!